Do you ever get caught up in the “to do” list that the little things escape your notice? Some days I’m just waiting for the next email, the next piece of news, the next mess to clean up that I forget to slow down and simply enjoy the moment. I may be focusing on situations beyond my control or feeling groggy from a wakeful night. I may be distracted by the media around me or too focused on what I *want* to be doing instead of the reality in front of me. Either way… on these days, in these moments, I am missing out on life. Over the past 6 weeks or so, I have been taking a break from blogging and social media due to life circumstances – and during this time I have found it very useful to reflect on what I want from my life. And I want to slow down. Luckily one of my favourite bloggers – Shawn Fink – has recently been writing about just this topic, and I have been savouring her articles and finding them extremely pertinent to my life. I thought my readers would also greatly enjoy her work, so I’m happy Shawn has offered her time to be interviewed here. Chelsea: Tell us about you! Shawn: Hi there! My name is Shawn and I’m the founder of The Abundant Mama Project. I’m the mom of twin girls, who are 8 years old, and I am a family wellness coach for moms around the world who want to be more present, playful and peaceful at home with their children — and in their lives. When I’m not online helping my clients, I love writing, creating new things and being outside. Oh, and I love, love, love coffee and brand new journals. Chelsea: What would you say is The Abundant Mama Project’s main message for mothers? 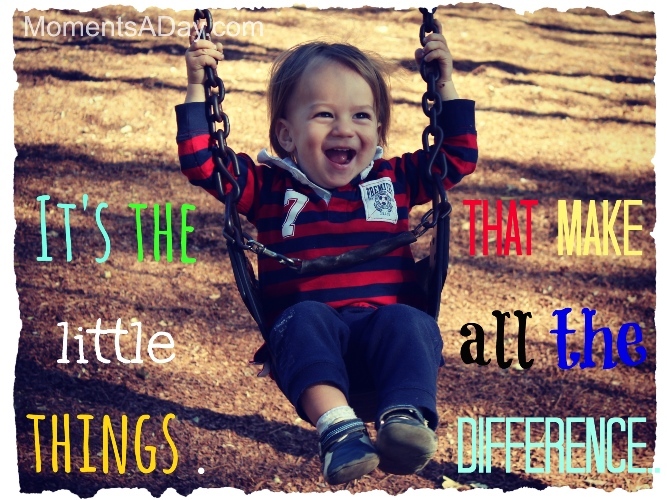 Shawn: The Abundant Mama Project is about helping you find your happy place as a mother. The focus in the project is always about helping you create a more peaceful family life so you can enjoy being a mother — and raise happy, thriving children. My hope is that this will lead to a more kind, peaceful world in the future. Chelsea: Can you introduce us to your new book – and tell us what makes it unique amongst the other parenting books out there? 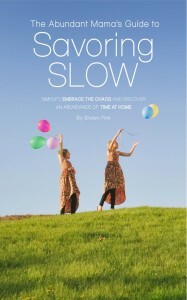 Shawn: The Abundant Mama’s Guide to Savoring Slow: Simplify, Embrace the Chaos, And Find an Abundance of Time at Home will help you see all the opportunities you have in your life to slow down, without actually cutting out the stuff you love. Savoring Slow is about embracing our busy lives — and we’re all busy no matter what we do or where we live — by grabbing hold of the opportunities in our days to live a slower, more meaningful life together. What sets it apart from other parenting books? 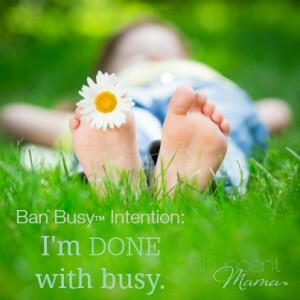 It is filled with dozens of actual challenges to get you DOING something differently right now to #BanBusy from your life and start relishing all the great things happening every day while raising children. Chelsea: I love the Ban Busy Challenge. How can people get involved? Shawn: Easy. They can sign up for the free 5-Day Challenge, which is simply five challenges sent to your inbox that will help you start to Ban Busy from your life. I encourage anyone with a blog to write about it and link up to share their own #BanBusy stories with the world. Chelsea: If I was a new reader coming to your website, what are the three articles you suggest I start with? Shawn: Well, I’d tell you to start on my New Here? page because it will guide you to find articles based on how you are feeling right now as a mother. If you are looking for ways to slow down and enjoy motherhood, I hope you will find inspiration in Shawn’s articles as I have. You can also get a copy of her brand new book, The Abundant Mama’s Guide to Savoring Slow by visiting this page.